Nola is a bit of New Orleans located in the historic Ramona Street Building in downtown Palo Alto. Our menu consists of Creole, Cajun, and Southwestern cuisine. 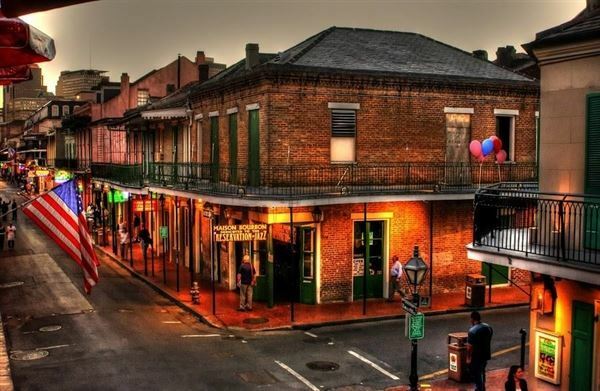 New Orleans favorites, such as hurricanes, fresh oysters, gumbo, seafood jambalaya, and étouffée, are just a few of the classics you will find. The party stretches out over three floors, with seven different funky dining areas. Nola has one of the largest collections of Southern folk art on the West Coast. From the dark side of the French Quarters come some of the hippest local "outsider" artists, such as Marc "Baby" Bercier, Big Al "The Shoe Shine" Tamplet, and A.J. Lastat Boudreaux. Other Southern greats, such as Frank "Preacher" Boyle and Robert Harris, capture that wild, funky life of the South. Lots of food, booze, and blues! Come check out what Fortune magazine voted as "the hottest bar in the Silicon Valley."